Part of the mission of TATTER and its corresponding library, BLUE, is to celebrate the unique relationship we have to cloth. At BLUE, we feel that each book in our collection is a gift. Each volume, periodical, or exhibition catalog is a unique contribution to the continually developing conversation of fabric - and the evolving roles it plays in our lives. Late last spring I was dreaming of a way to come together as a community and highlight the importance of these books. I thought of the Barbara Walker Treasuries. So iconic. Still so relevant. In the late 1960’s Barbara Walker, a journalist and author of many non-knitting related books, compiled and published one of the first knitting stitch dictionaries. Comprised of hundreds of patterns - some with historical references - Walker’s A Treasury of Knitting Patterns remains one of the most comprehensive and pioneering how-to bibles of knitting. Walker went on to publish three more treasuries! They are still in print, still marvels, and grace so many of the bookshelves of today’s knitters, continuing to educate and inspire. Generations of artists and designers credit Walker with the inspiration for their own creations. What does it mean to have added so much to the global conversation of knitting? How does one quantify a legacy like this? BLUE is not just a library of books and printed matter. It is also home to objects, swatches and garments. These material artifacts are the evidence of our historical cloth conversation. They make the print on the pages come alive. Many of us knitters have held or thumbed through Walker’s treasuries, our minds filling in the tactile blanks of hundreds of black and white swatch photos. I myself have long wanted to see these images at least in color - if not outright desired to slide my fingertips across the actual bobbles and cables. I think this is how the project came to be. Part homage to Barbara’s legacy, part endless desire for textile community, part educationally driven, and part curiosity about others who share my love of knitting and these incredible volumes of stitches, I embarked on the community-sourced crusade of knitting a BLUE version of Walker’s first treasury. I made a simple (and naive!) request on social media. Hey Knitters! I casually announced, We’re knitting BW’s first Treasury. Direct message me if you want to contribute! Of course I had no idea what I was getting into, and no imagining of what the project would come to mean. Knitters worldwide reached out. We gave them directions. Loosely: knit your assigned swatch, in any blue fiber you wish, in roughly a specific dimension. But also this: tell us where you are from, when you learned to knit, what knitting means to you, what BW and her treasuries mean to you. And then the swatches began to arrive in the mail. Each one was beautiful, and like a love letter - an unexpected nugget of true humanity, the antidote to the news! How wonderful. Before I knew it we grew to 400 knitters from 14 countries. And in addition to hundreds of swatches, we have hundreds of stories. What knitting means to you. What BW means to you. What knitting, across our planet, means - to all of us. This has certainly been a wonderful project. I send my most HEARTFELT GRATITUDE to each person who contributed their time, their craft, and shared a bit of their life. The very last swatches are rolling in. We have the most amazing blue version of Barbara’s first treasury, and as my fingers slide across the bobbles and cables, across the eyelets and ribs and tucks, I say - COME AND SEE. Come to the library and experience this marvelous thing. I just finished cataloguing over 300 Exhibition Catalogs in the library. Different from the more fixed qualities of larger book projects, printed exhibition matter feels current and cutting-edge - a fresh response to a theme or period in time. As a librarian and archivist I can sense something’s historical richness and research value. These particular materials were originally gathered over a lifetime by textile artist and teacher Carol Westfall, and arrived at BLUE as part of her acquired library in 2017. I was profoundly impressed by the breadth and depth of the collection, in addition to the wealth of creativity and skill so vividly on display. Primarily ranging from the 1970s-2010s, with some dating back to the 1950s, the collection is a sweeping survey of avant-garde fiber art and artists. The catalogs trace the evolution of the fiber art movement, and simultaneously highlight interesting work being done in the overlapping fields of fashion, paper art, basketry, soft sculpture and other handcraft, thereby firmly positioning fiber as a relevant medium in the historical canon of craft. Carol lived and worked in New Jersey, giving the collection a northeastern U.S. focus, although she traveled, exhibited, and collected far beyond that. The exhibits stretch across the country, with some stops overseas, detailing shows taking place at colleges, museums, galleries and festivals. A wide range of events are included: juried and thematic exhibitions, showings of private collections and student work, craft guild presentations, and solo shows. The work of fiber artists now regarded as pioneers of the field sit alongside lesser-known names waiting to be rediscovered. Some feature Carol’s own work, situating herself within this dynamic movement. Many are art objects in and of themselves, printed matter that expand upon the book form in beautiful and delightful ways. Taken together, the collection showcases the enduring power and creativity of the discipline, of women (and men) taking gendered traditions out of the home, borrowing and building off techniques found across the globe, challenging our ideas of what’s beautiful and possible, and responding to the times with political and feminist critiques. It is clear the collection has the most value as a distinct body, maintained as a singular unit, rather than separately integrated within the other books on BLUE’s shelves. I can imagine how inspiring and instructive this collection could be in the eyes and hands of fiber artists, students, and researchers - anyone with a more panoramic curiosity about where the field has been, and where it might be taking us. And so I invite you to come and enjoy these unique artifacts, to hold them, learn from them, and let them transform you - as is their potential power. The building of a library. A textile library. 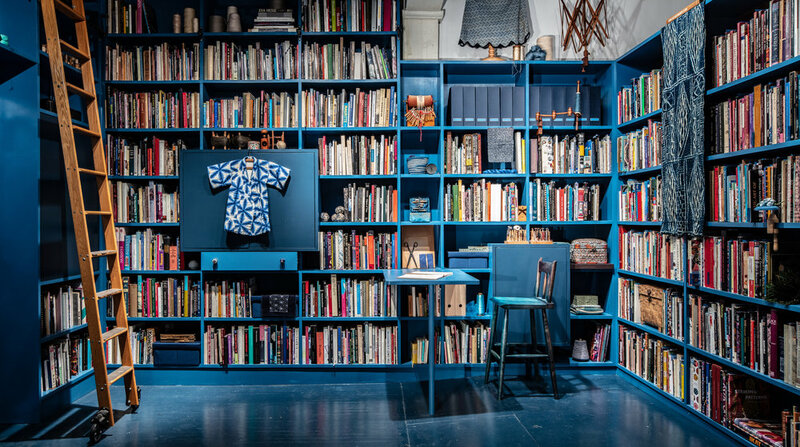 A blue textile library. Quite possibly the first seedling is passion: cloth. Cloth and all of its mysteries, how and where was it made? For what reason? How indispensable was its role in a human’s life? Next, a verb. Collecting. Gathering, amassing, sometimes hoarding. But not random hoarding. Hoarding with a purpose. After a time there exists an archive, a treasury, a vault. A secret place glittering with correlated information. Not to be forgotten is the essential notion of scope. Parameters. Matter which is linked by its relatedness. Scope is a reason for being. Scope is a means to understanding. 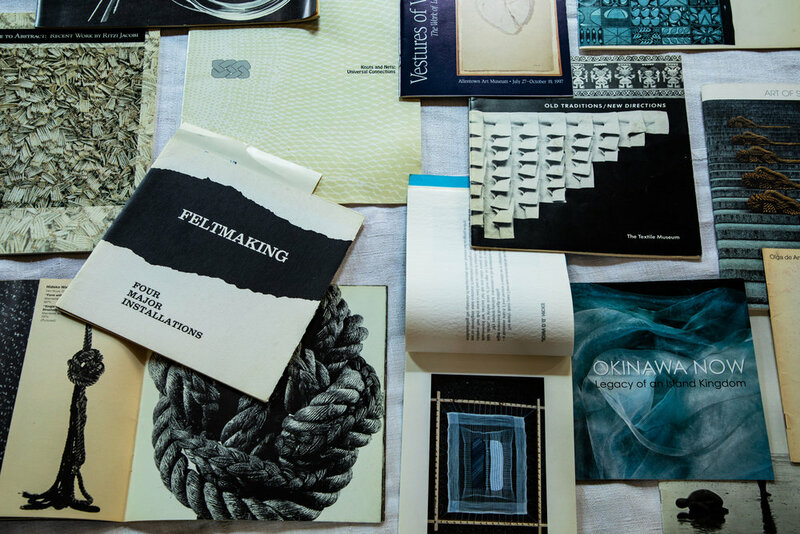 BLUE: TATTER Textile Library is a deep blue physical space, home to thousands of volumes of printed materials, catalogued and shelved alongside hundreds of blue, textile-related objects. Stirring the tactile within us, the objects converse with the books, serving to illustrate their pages, manifesting the stories and techniques within. Immersing oneself in a library is akin to the alchemical process of the dye bath; as undyed hemp might descend irreversibly into the blackest ink of the indigo vat, so may a library transform a person - forever altering the direction of thought, and therefore, the future. I am part maker, part collector, part legacy torch-bearer. I was raised to value cloth and the innovation and human labor behind it. In my childhood, specific fabrics or garments personified unforgettable moments, where I remembered not what was said, but rather, what I was wrapped in. Not so much the location of the happening as how its cloth interior was arranged. The authors on my shelves are each themselves a library - a life spent gathering, editing, and finally presenting information. And so I give you this library. This blatantly blue room. A product of my collecting, my connecting, my love of blue, and my memory. is the founder of TATTER and its BLUE Library. Growing up, I watched how my grandmother, Edith Wyle, engaged art, textiles, objects and books to connect with people. They became monuments of her diverse travels, and she coveted them with tenderness and wonder. She was always opening books, showing their contents, displaying her textiles and objects just-so, telling human stories. On afternoon visits with her, we traveled together by reading. We wandered the pages, absorbing the saturated colors of the photos, or touching the objects on her shelves. It was she who first inspired my love of indigo and blue, through her fascination of Japanese fiber and cloth. Like Edith, I’ve always been a collector of books and an arranger of space. Books are my companions, records, agents of change. They chronicle human experience, help us notice more, connect us to each other. Most importantly, they are the keepers of information: inventions, achievements and techniques. And then there is space. Space arranged specifically has the ability to inspire contemplation. The collection in this library began with a thousand volumes from Edith”s personal library, along with some of her amazing textiles and tools, and the desire to share these rarities with the public. Over the years it has grown, as I have added to it, diligently and enthusiastically. I am always entranced by a new blue object, looking for clues of its maker or previous owner. Regardless of factual information, these objects and fragments inspire emotion, and serve to represent our cultural heritage. I deeply loved the way my grandmother related to objects. How she cared about the people that made them and the stories they held. That she taught me to do the same, thereby expanding my ideas about language into the realm of the visual and tactile. ‘Stories can be touchable,’ her way seemed to say. The TATTER Blue Library seeks to add to the reading experience, with objects you can hold. STITCHTEMBER is a series of four, unique and exclusive stitching workshops, with accompanying historical lectures in the month of September - in honor of New York Textile Month, led by artists and educators. Purchase any workshop for $150 or the entire series for $500. Japanese Boro Textiles and Hand Stitching Workshop, lecture by and highlights from the collection of Stephen Szczepanek, owner of Sri Textiles, in Brooklyn, followed by stitching workshop ‘The Boro Tote,’ created and led by esteemed author Kaari Meng, owner of French General in Los Angeles, California. This course will begin with a lecture about the history of Japanese folk textiles with diverse examples of antique mended cloth and sashiko stitched yardage and garments. Students will then hand-piece a beautiful square sampler using traditional Japanese stitched to adorn a linen tote. Hungarian Written Embroidery, lecture and stitching workshop by artist Sarah Pedlow of San Francisco, California. This workshop teaches the basic stitches of Hungarian written embroidery, a folk style that originated in Transylvania, Romania in the late 18th Century. Students will stitch a heart or tulip design on a piece of linen that can later be sewn into a small bag, pin cushion, or decorative hanging or added to a quilt or clothing. Stitchers will also take home resources on Hungarian embroidery and patterns. Sarah will share her knowledge of the culture and history of Transylvanian textiles and her extensive travel experience in Hungary and Romania. Traditional Palestinian Embroidery, lecture and workshop by artist and educator Wafa Ghnaim, Brooklyn, NY. Traditional Palestinian Embroidery will focus on the preservation of the indigenous, time-honored and endangered art of Palestinian embroidery. 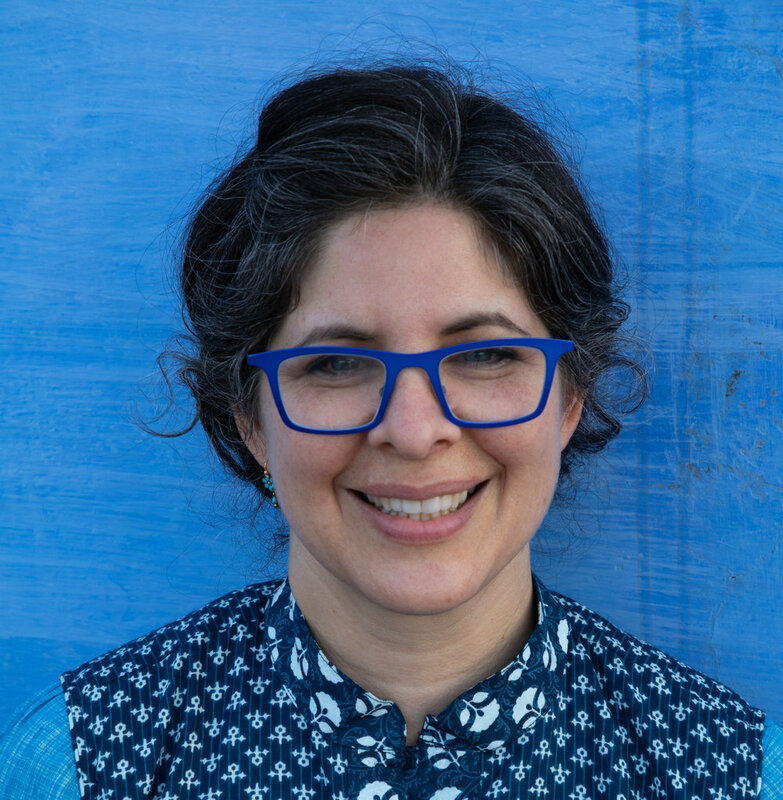 The workshop is centered on her new digital book, Tatreez & Tea: Embroidery and Storytelling in the Palestinian Diaspora, which attempts to preserve the craft of embroidery as well as the art of storytelling that is encapsulated in each traditional Palestinian motif. Participants will learn how to embroidery a traditional Palestinian embroidery motif, using the cross-stitch technique, to create a small wall-hanging to frame. To learn more about the book project and organization, please visit www.tatreezandtea.com. Modernist Smocking, lecture and workshop by artist, designer and architect Annie Coggan. This workshop will investigate the modernist potential of smocking and explore the world of three-dimensional embroidery. Designer Annie Coggan will share her historical research conducted at the TatterBlue library this summer; her method of visual scholarship and brand of “hand-making history” that has lead her to create a smocked armchair for the library. The evening will include Coggan’s insights on the history of this technique as well as a hands on workshop examining smocking techniques and modernist experiments. You can see her work at anniecoggan.com.